Got a new employee orientation coming up? I put together 10 of my favorite ideas that I like to include in my own orientations. 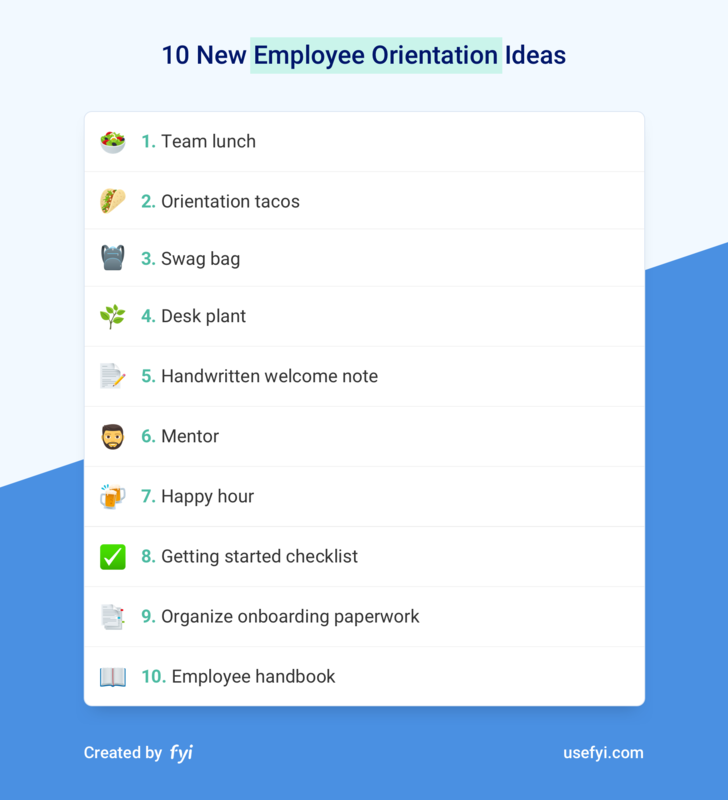 Not only will these ideas make your orientation look polished and professional, but your entire team will genuinely enjoy them. And your new employees will feel welcomed to the team. The new employee lunch, probably the most standard orientation idea out there. It’s super easy. All you need to do is schedule a reservation and invite the new employee’s immediate team. The cost can be really reasonable, especially if you pick a casual place. People naturally bond and socialize over food. It also gives your team something enjoyable to participate in. The main piece of advice that I have for team orientation lunches is to pick a place that matches your company culture. If you have a formal work environment like a law firm, you want to find an upscale lunch location. On the other end, an informal environment should look for for something more lowkey like a food truck. Whatever you choose, make sure it’s a great place. If you’re not sure, ask one of the foodies at your company for recommendations. It doesn’t have to be tacos, it can be anything. The point is to turn lunch into an orientation tradition, that’s much more powerful than an ordinary team lunch. Think of what makes a holiday meal such a great tradition. Part of it comes from the fact that holiday meals are only eaten during the holiday, we don’t generally have that food during the rest of the year. The exclusivity anchors the tradition and makes it stand out. You can do the same thing during your orientation. If you know an amazing catering company, you could have them cater a lunch during orientation. The trick is to only have them cater that meal for orientation. That will turn the lunch from an ordinary meal into an orientation tradition, marking the event for the entire company. You can still have catered lunches for other events (some companies cater lunches every Tuesday for example) but there should be a special lunch that marks the orientation for a new employee. I’ll be the first to admit, putting together a great bag of swag is pretty difficult. The bag of useless swag has long been a cliche. A couple of high-quality swag items can still resonate with people though. As long as you carefully select each item while choosing quality or quantity, it’s well worth the effort. A bag of 2-3 high-quality swag items makes for an amazing orientation welcome gift. The company t-shirt. The trick for turning these into sought-after items is to add some exclusivity. Do a new t-shirt design each year or have a special t-shirt just for new employees. People go bananas over special t-shirts. Moleskin notebooks. It’s easy to get your company logo on them and they’re premium notebooks. They’ve become pretty common for a reason. The company hoodie. These are more expensive so you can’t hand them out quite as freely as t-shirts but they make a great addition to an orientation swag bag. Logo stickers. Always a hit, lots of folks love placing stickers to personalize other items like laptops. These add a lot of value to people at a low cost. Water bottles and mugs. Just make sure that the bottles and mugs you choose are high quality. Most of them aren’t, they feel cheap when you use them which defeats the point of the swag. Socks. Swag socks have gained a lot of popularity in recent years. They’re fairly easy to produce and aren’t that expensive. Figurines or plush toys. This works best when your logo has a character in it or you have a company mascot. If you do have a mascot of some kind, a figurine or plush toy will become the most valuable piece of swag you could offer. The main downside is that they’re much more complicated to source. They also won’t be cheap. Books. If there’s a book that embodies how you run your company or the mission that you’re on, it can make a great addition to a swag bag. Just remember that most people only read 1-2 books a year, if that. So try to pick a book that’s an easier read and really packs a ton of value. Empty desks look… lonely. Sure, they may be a blank canvas but an empty desk is never welcoming. One way to make the desk more inviting on the first day is by sprucing it up with a good desk plant. Not only does the plant make a good gift, it adds a lot of warmth to an otherwise barren desk. Try to get one that lasts. A bouquet of flowers looks amazing but they’ll have wilted within a few days. Pick a plant that’s easy to care for. Most people have no idea how to care for plants. If you pick one that does well with sporadic watering, it’ll last a lot longer. Avoid cactuses unless your office culture is into ironic or fun gifts. Cactuses are super easy to care for but a lot of folks don’t see the appeal. Try to make each plant a little unique, at least get a different pot each time. People should be able to say “that’s my plant” instead of walking around an office with identical plants on each desk. Postcards and hand-written letters have almost disappeared entirely from our day-to-day. That means when we do get a handwritten note, it really stands out. Whenever I want to make a message really resonate with someone on my team, I always write a note by hand. People remember them for a long time. I’ve even saved the few that I’ve received, they mean a lot to me personally. Find a high-quality blank card. Paper Source is a good place for these. Try to avoid the overly-commercialized Hallmark cards. Tell them how excited you are to have them join the team. Mention a few specific details about the person so it’s obvious it’s a personalized message. Tell them why you think they’re a perfect fit for the role and their strengths that will set them up to succeed. If you write a note and leave it on the employee’s desk on their first day, I guarantee they’ll treasure it for years to come. A senior employee is tasked as a mentor for the new hire. The mentor checks in regularly during the first few weeks, then checks in every month for 3-6 months. Mainly, the mentor asks how everything is going and if there’s anything that the new employee needs help with. The new employee also has someone to go to for guidance. This all sounds great in theory but can be a little trickier in practice. First, we have to come to terms with the fact that some employees are not cut out to be managers or mentors. They may be extremely skilled at their job but lack the skills needed to coach and support others. If we pick a poor mentor, the new employee orientation will suffer greatly. It’s not just a missed opportunity, a bad mentor can accidentally encourage the new employee to quit. Be extremely careful with the folks that you select as mentors. They should naturally show a willingness to help and support their colleagues during their normal projects. If they’re abrasive or prefer doing their own thing, find someone else. Poor mentors can also be selected by going in the opposite direction. At every company, there are a few people that truly love helping everyone around them. They’re constantly checking in, asking how everyone’s feeling, and looking for ways to make everyone’s job easier. These are truly amazing people. When selecting mentors, we naturally think of these people. The problem is that they often don’t have the hard skills in the role that the new employee just joined. So while the new employee gets tons of support in general, they don’t get any guidance or training with their specific role. The best mentors are senior folks with deep experience in similar areas for the role that the new employee just stepped into. They should also be deeply committed to coaching and nurturing colleagues more junior than themselves. When the right people are selected as mentors, it makes an enormous difference during the new hire’s orientation. This idea is pretty common across company orientations. On the first day or sometime during the first week, invite the new employee along with some of their teammates to a happy hour at a local bar. It’s easy to implement and all you need is a bar tab. There’s one trap to avoid though. In high-pressure work environments where everyone has a lot on their plate, folks will start skipping these happy hours. That makes sense, they’re stressed out and need every hour that they can get. But as the new employee, it’s extremely demoralizing to show up to your own happy hour and only have a couple of other people attend. So if you’re going to schedule happy hours for new employees, make sure there’s a decent size group that attends. As a new employee, there’s a lot to absorb right away. It’s easy to get overwhelmed. To ground the employee and give them some structure around their first few days, give them a “Getting Started” checklist that includes every orientation task that you want them to complete. This could include things like filling out all the HR documents, setting up their accounts and laptop, and attending a team happy hour. Like any good checklist, keep it succinct. Explain all the policies and context elsewhere, the checklist should tell any new hire what they should be focusing on with a quick glance. It’s your first day, you’ve had a rush of information and meetings during the morning. You sit down at your new desk, imagining what it’ll be like to work there in the coming months and hopefully years. Then someone comes by and drops a giant stack of HR documents in front of you. Your first “project” is to slog through all the documentation, find the stuff you’re supposed to sign, and hopefully fill it out correctly. It’s not exactly a thrilling or welcoming experience. There’s no way around it, all the HR paperwork has to get completed. But during orientation, a little extra effort can make it a dramatically better experience for new employees. Go through all the paperwork and organize it into sections. Print out brief instructions for what each section is for and how to make the most important decisions on things like benefits. To really go the extra mile, use those signature sticky notes to flag all the signature sections and tag all the forms that need to be filled out. A well-organized collection of paperwork communicates to the new hire that they’ll be supported throughout all their projects and can easily get help. Putting an employee handbook together can seem like a trivial exercise for long-time employees. That’s because the curse of knowledge prevents us from remembering how long it took us to learn everything that we now know about the company. Everything from policies, the mission and values, to unwritten rules, core aspects of the culture, and who to go to for help. Learning all these day-to-day details takes new employees months to absorb even though we now take it for granted. A well-written and succinct employee handbook makes an enormous difference for employees. It’s their map when they feel lost or unsure of themselves in the early days. Many companies will maintain a handbook through a wiki or folder of documents. To really make your employee handbook stand out, you could self-publish it. Having a physical copy adds a lot more weight to the message and makes it feel more authentic. The downside is that it’s harder to update. One solution is to print enough copies to last you a year or two, then do an update, and print your next batch.